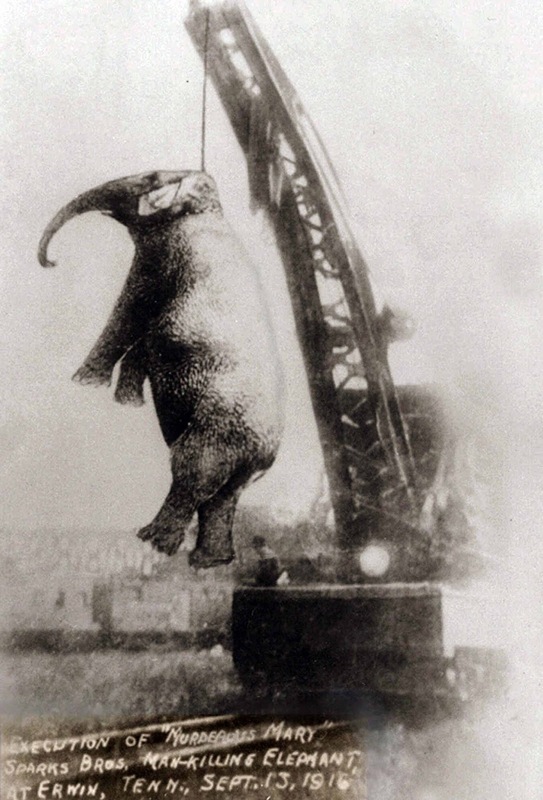 On September 13, 1916, the town of Erwin, Tennessee, hung 'Murderous Mary' the elephant after she mauled one of her keepers to death the day before. Mary’s talents included picking out 25 tunes on musical horns, which she tooted with her trunk. She was also the champion pitcher on the circus’s baseball team. But on that tragic day, she had been stripped of her red-and-gold saddle and head-dress of artificial blue feathers and stood tethered in disgrace outside the tent. Between 1882 and 1930, there were 214 victims of lynchings in Tennessee. Most were black men, summarily found guilty of such crimes as ‘fighting a white man’ and having ‘bad character’. But soon their tragic ranks would be joined by Mary, surely the only elephant in history ever to have been hanged. And it seems particularly pertinent to remember her in the week that Prince Charles hosted a much-heralded international conference to address the illegal trade in wildlife parts. Elephants were among the species highlighted as most at risk, but the supposedly enlightened Western world has not always been so concerned about the welfare of these majestic creatures, as we are reminded by the barbarity of Mary’s death.